Enter Pearce at Pavilion, and instantly feel transported to your very own modern getaway. From palm tree-­lined pathways to serene waterscapes, imagine coming home to a brand new, contemporary abode infused with upscale finishes and the ultimate destination in resort-­style apartment living. 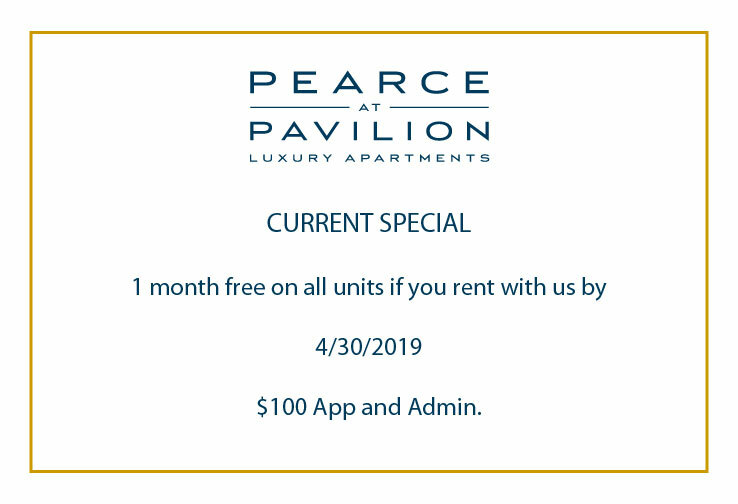 1 month free on all units if you rent with us by 4/30/2019. Located in a new, upscale area just 10 minutes from downtown Tampa, this property boasts 250 luxury apartments in Brandon, FL and an ultramodern clubhouse with a wealth of contemporary amenities. With a pool that overlooks the on-­site pond, cabanas, a spa, outdoor kitchen and living room, and with our apartments near Tampa, FL being next to top dining and shopping, apartment living just doesn’t get any better than this. Contact us today to learn more about our brand new pet-­friendly, smoke-­free community, where every day is a modern getaway.